Aarti, also spelled arathi, aarthi (from the Sanskrit term Aaraatrik) is a Hindu religious ritual of worship, a form of puja, in which light from wicks soaked in ghee (purified butter) or camphor is offered to one or more deities. 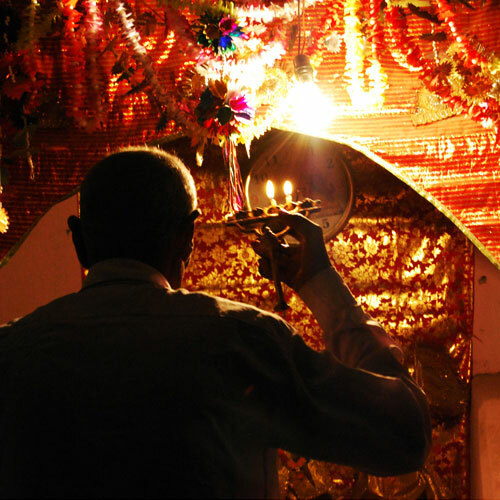 Aartis also refer to the songs sung in praise of the deity, when offering of lamps is being offered. Today we will give you the answer of some questions. During the aarti, the various items offered to the Deity represent these elements: the flower and the cloth represent earth, the water represents the element water, the ghee lamp represents fire, the yak-tail fan represents air, the sound of the conch and the bell represents ether, the emotional involvement in the songs sung and the mantras chanted represent the mind, the intellectual focus on the purpose of the aarti represents the intelligence, the obeisances represent the ego and the pujari represents the assembled worshipers. All the items are offered by waving them in a circle around the Deity, to remind us to keep the Lord at the center of all our activities during the cyclic motions of time from the minutes to the decades.